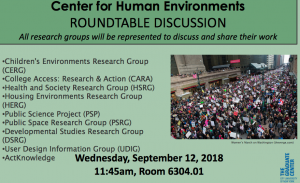 Environmental Psychology at The Graduate Center » Brown Bag September 12th 2018! Brown Bag September 12th 2018! All are invited to our first Brown Bag of the Fall 2018 Term! This Wednesday, the amazing folks at the Center for Human Environment will be discussing the work they do! Our Brown Bag events are free and open to the public!